GLYSOLID SKIN AND HAND CREAM with Glycerin and Allantoin is designed to treat sensitive, stressed and damaged skin. The Glycerin used in Glysolid is vegetable based does not contain any form of gluten and is derived from palm oil and coconut oil. 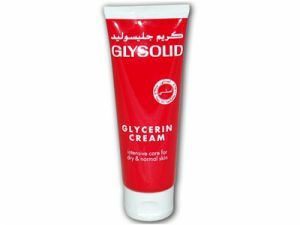 Principle effect of Glycerin: A skin softener; it keeps skin cells supple and flexible. Principle effect of Allantoin:Stimulates skin cell regeneration and the healing of small injuries, nicks, scrapes and minor burns. Intensive care for dry and normal skin. Maximum satisfaction when used in small amounts on a regular basis. Restores the natural beauty of the skin while softening it. Made without preservatives or perfumes. Compatible for all skin types. Provides rapid relief to irritated skin, including eczema, psoriasis and parched skin from chemotherapy and radiation treatment.